Six years ago, Sodom made the decision to rerecord their first EP, In the Sign of Evil (in addition to unveiling a handful of new tracks). Fans scoffed, sneered, and jeered at the idea, but given the history of poorly rerecorded music, they had every right to be skeptical that the final product would come within close proximity of the original. No matter how perfect the material is, the original, in the eyes of the existing fan base, is superior. See reviews on Metal Archives as proof. Fast forward to 2014. 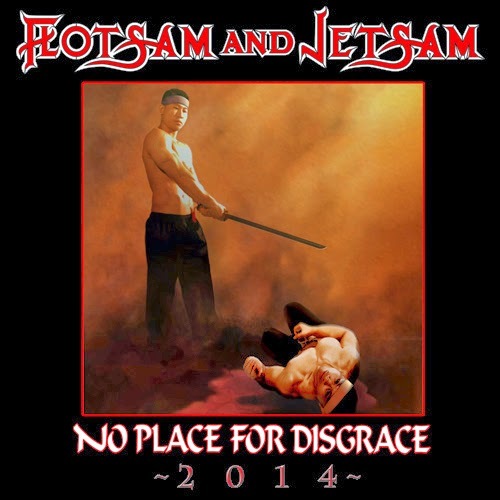 Last month, Flotsam and Jetsam served up a refreshed version of their perennial classic, No Place for Disgrace, a record that enjoys status as their best album even today. As the story goes, over the years, fans clamored for a remixed version of the record, but because the original master tapes weren't easily obtainable, Flotsam and Jetsam chose to rerecord the music. And that's when trouble in paradise set in. Common sense points out that No Place for Disgrace was released almost 26 years ago, and time is, unfortunately, rather revealing in what it can do to musicians. In this case, it's not so much the instruments but instead Eric A.K. 's vocals, which sound tired and lack the range he enjoyed at the height of his career. It's one thing to rerecord material when you possess the chops to match your previous performance; it's the other when you simply can't perform as you could in the past. Sometimes it's best to sit back and consider what you can and can't do. Flotsam and Jetsam circa 2014. Often times, a situation like this tarnishes a band's reputation, to the point that fans swear off future releases. But, fortunately, Flotsam and Jetsam still sounds solid instrumentally, even though the modern production does the guitars, drums, and bass no favors. Aside from the vocals, the fundamental issue with No Place for Disgrace - 2014 is polished music that lacks power in comparison with the original. Because the existing fan base subjects the rerecording to so much scrutiny--picking apart every last detail--it's inevitable that the original will be closely compared with the new, and sadly for the powerless 2014 version, the music can't stand well on its own. Perhaps the most interesting issue with No Place for Disgrace - 2014, however, isn't the music itself but why Flotsam and Jetsam couldn't secure the master tapes to their own music. Looking at current line-up, nearly every member took part on the original, so it's not a question of whether or not it's the same group of musicians; it's simply an issue of rights--rights Flotsam and Jetsam obviously doesn't own, and by creating a new record with rerecorded music, could own. No Place for Disgrace's original cover art. Au contraire. Flotsam and Jetsam was never hugely popular like contemporaries Metallica and Anthrax, so that rules out the possibility of a down and dirty cash-in. Aside from the crowd that grew up with the music, there's simply not enough evidence that rerecording No Place for Disgrace would be a positive financial blip on Flotsam and Jetsam's radar. That leaves catering to the fans, or a matter of owning the rights to their music, albeit in newly recorded form. 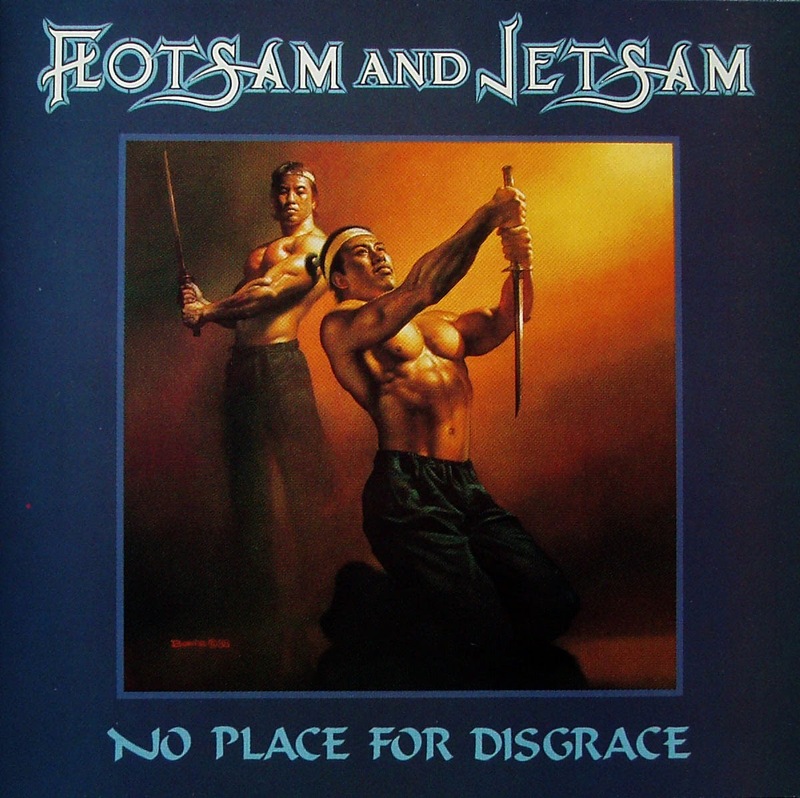 If fans really were begging--because I sure as hell wasn't--for a rerecorded record, then I admire Flotsam and Jetsam more than they'll ever know for listening to their fan base. If it's an issue of rights, I could be persuaded to understand their viewpoint, but to rerecord a classic for the sake of owning the music seems silly. To ruin the legacy created 26 years ago is just downright tasteless, and they would be better off pursuing the rights to their music. Either way, No Place for Disgrace - 2014 is a very real record, much to my dismay. According to word around the Internet, the music has, surprisingly, been well received, so perhaps the end isn't near for Flotsam and Jetsam. In the future, it wouldn't be a bad idea to stick to writing new material suitable for Eric A.K. 's vocal range, because anything else just feels like a bunch of old men reaching for glory that they're never going to enjoy again. No Place for Disgrace - 2014 is one for the bargain bin. I can understand the band not being able to admit to themselves that their vocalist just doesn't have the chops anymore. I can hear the conversation in my head, "No, no, it's good. Your voice has more grit and weight to it now." I don't buy it, but I can imagine it. What I can't figure out is why on earth they thought it was a good idea to change the lyrics and slow their playing down. And the artwork! The first album cover captures this perfect dramatic moment, where the subjects are poised to take a savage, tragic, and somehow noble action. The new artwork just shows you the sad aftermath of that action, where it now seems wasteful and in retrospect, pretty stupid. Always baffling when artists just don't seem to have a clue what it was that made their best work so awesome. Though, maybe it shouldn't be. It's not like they followed the original up with a slew of high caliber thrash albums. Have you heard Harem Scarem's Mood Swings II? That might be the only re-recording I actually prefer to the original. You've given me yet another album to check out! I'll add it to the ever-growing list. We seem to agree on a lot of things, so I'll take your word that it's a good listen. 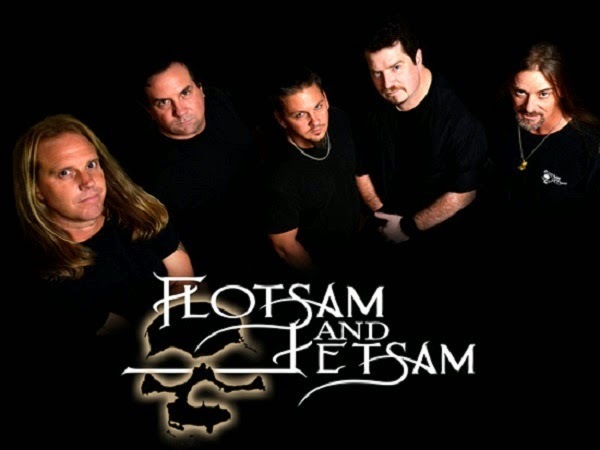 Normally, rerecording material just doesn't work when the band is missing the youthful zest necessary for making upbeat music, and Flotsam and Jetsam is proof of that. Like Sodom and F&J, Dokken also rerecorded material, and the results weren't great--Don Dokken is in even worse shape than Eric A.K.. Anyway, even though the music isn't great, I'll agree that No Place for Disgrace's reworked cover is the perhaps the worst part. I think we can draw a parallel between the bleeding out man and Flotsam and Jetsam--both are defeated and a shadow of what they once were. Flotsam and Jetsam listened to the fans who wanted the album redone, but they need to look into the talk around the web and consider the consequences next time they get the bright idea to rerecord a classic. I realize that the response for No Place for Disgrace - 2014 is divided, but it's pretty clear that the people who started with the original prefer it over the rerecording.